Nate Chisholm was one of three teachers who accompanied Steve Newton on the NCSE Grand Canyon rafting trip. This is a blog post about his experiences. For a week this summer I was privileged to be given a seat on a time machine measuring less than twelve meters long and powered by a small outboard motor. We began our journey at Lee’s Ferry, Arizona, and over eight days traveled back in time roughly 1.5 billion years to a time when multicellular life did not exist on this planet. Of course, I am referring to the annual Grand Canyon river trip sponsored by the National Center for Science Education! This trip was dedicated to the examination of the geological, paleontological, and archaeological evidence found in the canyon, as well as being a fun adventure the entire time. Living in the canyon for over a week revealed an abundance of science, but also a smattering of history, both of which I love immensely. This trip will influence my teaching for the rest of my career! Gazing up at the beautiful Milky Way as we slept on the sand each night, we were reminded of our minute size in an immense galaxy. Then every day, as we encountered progressively older rock formations, we were reminded of our tiny span of existence within the larger picture of geologic time. 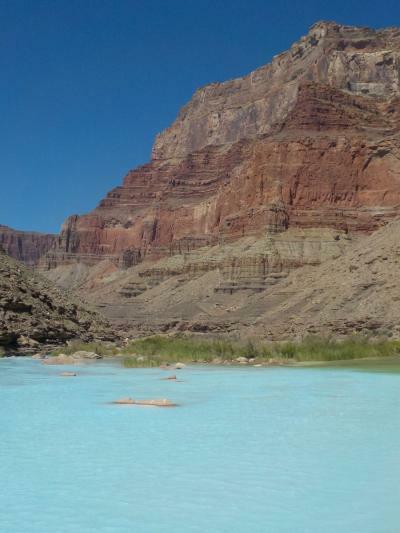 We experienced places sacred to many Native American tribes, such as the blue waters of Havasu Canyon and the confluence of the Little Colorado River and the Colorado River. Today, the confluence is also sacred to the endangered humpback chubs whose population has dwindled into these tributaries where they can still survive. We met teams of researchers trapping these fish, implanting microchips in them to better track and understand their population dynamics. Time will tell if these organisms vanish from the earth due to the difficulties our species has wrought upon their existence in the Colorado River. Over the course of the entire trip, we soaked in (literally!) as much possible adventure with each rapid and side canyon we experienced while inside the depths of the Grand Canyon. We were not the first to relish the experience of living in the Canyon. In fact I enjoyed the human history revealed within the Grand Canyon almost as much as the geological history. We saw an ancient bridge, pottery sherds, storage granaries, and foundations of dwellings made by ancestral Puebloan cultures roughly a millennium ago. These people’s migration from this region, probably due to an inability or unwillingness to adapt to climate changes, remind us that our descendants may someday evaluate our strategies to cope with or mitigate the anthropogenic climate change of today. We saw exploratory drilling sites and remnants of the camp and tramway at the proposed Marble Canyon dam site, which, if not opposed just a few decades ago by groups of citizens such as the Sierra Club, would have flooded the first day and a half’s worth of river that we traveled. We saw debris left over from a 1957 flood, high above the current flow, testament to how much more powerful the Colorado River was before the Glen Canyon Dam was built. But most importantly, we witnessed science firsthand! Before we even touched the frigid water of the river, we saw two California condors, back from the brink of extinction. Then over the next few days, we saw evidence of much earlier species that ultimately succumbed to the opposite fate, such as crinoids and Permian reptiles (ancestors of the dinosaurs), as well as orthocone nautiloids. The details in these fossils were spectacularly preserved, not destroyed in a global flood soon after deposition. We saw terrestrial river channels of Devonian age incised into limestone rocks formed in shallow seas, and in time overlaid by younger limestone, another piece of evidence for an ancient earth undergoing climatic changes as oceans recede and advance. We saw characteristic life forms in each progressively older rock layer until there were no fossils recognizable to the unaided eye because multicellular life had not evolved yet. By this time we were surrounded by ancient igneous and metamorphic rocks such as the Vishnu schist and Zoroaster granite. At a few places in the canyon, the Great Unconformity is visible, a gap of 1.2 billion years not deposited or eroded away from the sequence of rocks. We were privileged to stop and place our hands on either side of this gap in time after a short hike up Blacktail Canyon. In more recent times, lava flows have plugged the canyon until the river can erode a new path around or through the resulting basalt. In these places we could see the former path of the river, preserved by dark basalt within lighter rock, and of course the current path of the river, on which we were floating. This trip provided an ideal combination of history, science, and adventure that I can take back to my classroom in Colorado. I can describe to my environmental science students more fully the environmental impacts that dams have on riparian ecosystems. I plan to have my biology students analyze the depositional environments that each of the Grand Canyon’s distinctive layers formed in, so that they can see the evidence for these changes in climate over millions of years of the Earth’s history, not within the span of one year of global flooding. I am humbled and grateful for this opportunity to represent so many skilled and qualified science teachers on this voyage of discovery within the Grand Canyon and will do my best to make the experience come alive for my students as well.